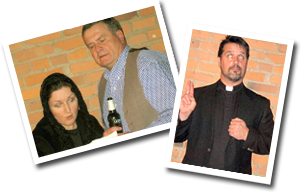 “Flanagan’s Wake” has been making people in Chicago laugh since 1994. It is the one of the longest running shows in Chicago theater history. It made its Cleveland debut in 1996, at Kennedy’s Down Under when local U.S. customs agent and “schanachie” John Regan brought it to town under his group, the “Irish Rodeo Clowns.” On August 30th, 2003, former Mayor of Cleveland, Jane Campbell, awarded the “Irish Rodeo Clowns” with a proclamation on the groups’ 500th performance of “Flanagan’s Wake.” What makes the show such a unique experience is the format of the show: interactive improv theater. The show depends on the wit of its audience. From time to time, the cast will request a suggestion from the audience that can take the show in one direction or another. The cast improvises the show based upon the audience “recollections” of the mythical Flanagan. The extended family at “Flanagan’s Wake” incorporates everyone in attendance that chooses to become involved, but in a way that makes you feel like you’re a vital part of the show. The last performance in Cleveland of “Flanagan’s Wake” was in 2003. Six long years have crept in its place. Downtown Cleveland has seen itself once as a hub for international corporations and retail establishments, and now a city climbing out of recession, striking to redefine itself and its people in the new economy. What better time to have a wake? If Cleveland is trying to resurrect itself, we’ll resurrect Flanagan! The group of actors that comprise the Frankie Kong Players are some of the most talented in Cleveland. Most were a part of the Irish Rodeo Clowns during its former presentations of “Flanagan’s Wake.” They are a dedicated bunch that have appeared on some of the finest theater stages Cleveland has to offer. The play may be a bit bawdy or a touch irreverent on occasion, but it is all in good fun. Cast and audiences are ALL family in the mythical town of Grapplin, County Sligo. We truly hope you will find comfort and good cheer in being an integral part of the show. Together, we will put the ‘fun’ in funeral.